We have decided to cancel our meeting for this Tuesday.We want to give everyone the opportunity to attend the Community Engagement meeting which is scheduled from 6 pm-9 pm on the same evening. We encourage all of you to attend and show continued support for our two school board candidates Fran Thompson and Andrea Wellnitz. The purpose of their meeting is for community members to provide input as OCS begins its Strategic Planning Process.The set up will be small groups where individuals will have opportunities to discuss and identify internal and external challenges, growth areas, opportunities, and success of the school system. Light refreshments will be served. Our committee has procured 100 Abrams signs for our county. Angie Eells and Tracey Wyatt will be available at Keba from 5:15 pm to 7:00 pm for those of you who would like to purchase a sign, say hello or eat a great dinner. Our cost was $3 a sign but we are asking for a $5 donation with the proceeds going back into getting our local candidates elected. We are giving signs away in exchange for one hour of volunteer time. We will have more details for you there. We believe this event is too important for folks to miss or have to choose. See you next month ON THURSDAY October 18th at 6:30 pm at the Chamber of Commerce. 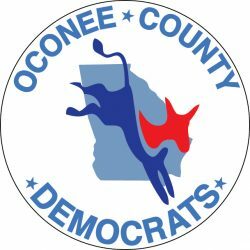 Keep checking our calendar, your emails and the website for everything you need to know about the campaign season and how you can help TURN GA BLUE.